NEW ORLEANS (AP) — One year after coming up a yard short of bowl eligibility, Tulane aims to avoid cutting it so close this time. The Green Wave (5-6, 4-3 AAC) needs a victory over visiting Navy (3-8, 2-5) on Saturday to reach the six-victory plateau, which would virtually assure Tulane its first bowl bid since the 2013 season and only its third since 2002. “We’ve increased our conference wins. 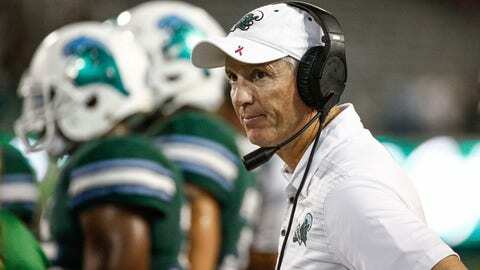 Getting to a bowl game would be big for us,” third-year Tulane coach Willie Fritz said. Tulane ended last season just short of the goal line as time expired in a wild 41-38 loss at SMU which doomed Tulane to a 5-7 record and a fourth straight campaign with no postseason. So returning players are no stranger to the scenario they face against the Midshipmen. Although Navy is having a down year, it snapped a seven-game skid with a 37-29 win over Tulsa in which senior quarterback Zach Abey rushed for 128 yards and two touchdowns on 26 carries. Navy amassed 389 yards on the ground in the game. The Midshipmen, who run an option offense and don’t pass much, lead the AAC in rushing with 304.6 yards per game. Navy slotback Malcolm Perry reached 1,000 yards for the season last weekend, his second straight season hitting that mark. Navy has yet to win on the road this season, having dropped 11 straight games played away from Navy-Marine Corps Memorial Stadium. Navy’s last road victory was a 31-21 triumph at Tulsa on Sept. 30, 2017. Navy has played in New Orleans 11 times in program history, going 2-8-1. But the last time Navy played at Tulane in 2016, the Midshipmen won, 21-14. TIME OF POSSESSION: With Navy keeping the ball on the ground, opponents tend to have fewer possessions than usual. So Fritz is emphasizing the importance of efficiency when his team has the ball. Navy ranks last out of 129 Football Bowl Subdivision teams in passing. The Midshipmen are averaging just 60.2 yards per game, or 20 yards behind 128th-ranked Georgia Southern. The Midshipmen have completed four passes or less in eight of 11 games and are only 1-of-4 passing for 15 yards in their past two games combined. Tulane’s running back tandem of Darius Bradwell and Corey Dauphine have combined for more than 1,658 yards from scrimmage, with both averaging better than 6 yards per carry. Bradwell, who has averaged 6.1 yards per rush and scored nine TDs, needs 82 yards to reach 1,000 this season. Dauphine has 740 yards and seven touchdowns rushing, averaging 6.7 yards per carry.